Today, most of us have become very conscious about the way we look. Thanks to the growing awareness about natural living, today we are more conscious about our skin, hair, health and general wellbeing. We have come to realize that self care is more than necessary for everyone of us and that’s the reason researchers are continuously working to bring the best to us. And I sincerely believe that all of us should prioritize the self-care and follow a routine that’s natural, healthy and good for our skin, hair and health. But today’s post is not about general health and wellbeing, but it’s about beauty and skin care. In this post, I am going to talk about the best beauty and skin care tips for sensitive skin. If your skin is sensitive and you are struggling in taking care of it, then probably this is the post worth checking. If you are looking for the best hacks and skin care tips for sensitive skin, then continue reading this post, as I unveil the most essential beauty and skin care tips for sensitive skin types. Besides the various other aspects of beauty, our skin definitely is an important factor as it forms a part of the first impression you make on others. But, sadly not all of us are blessed with a flawless skin, and many of us do face various skin issues. However, it is the individuals with sensitive skin who faces maximum skin issues as their skin is completely unpredictable and can get harmed very easily. To be more specific, people with sensitive skin experience a combination of all types of skin issues faced by people with other skin types. Well, that does not mean that you will not love your skin, as even with sensitive skin, you can look pretty just the way you desire. Maybe you have to be a little extra conscious of your skin but I think that is completely worth it. I myself have sensitive skin and had fought my own battles in looking after it, so I can feel your concern well, but trust me, it is OK. Today, I am sharing a list of 18 essential beauty and skin care tips for sensitive skin that I have discovered over a period of time. These skin care tips are going to help you in taking care of your skin and you’ll be able to make your skin healthy and glowing for long. Adopting and following a proper skin care routine is very important, because even if you have a beautiful skin, unless you take care of it by following proper skin care routine, it’s going to lose its charm over a period of time. So, that is the basic thing that we all must do for our skin, irrespective of the type of skin you may have. But, remember the beauty care routine is not the same for all types of skin. Even if the basic skin care procedures are same but you have tweak your skin and beauty care routine depending on your skin type. Now, since sensitive skin is certainly the most troubled one, today, we will learn about some important beauty and skin care tips for sensitive skin. I feel that these sin care tips will be of great help to you and so let us begin with the discussion. We call a skin sensitive when it reacts even to minor changes or circumstances. For example, while a normal skin can adjust to a change in temperature properly or is OK with a varied range of skin products; sensitive skin can get seriously irritated and have reactions. The sensitivity level of the skin also varies from person to person. So, the more sensitive your skin is, the more cautious you have to remain while take care of it or apply makeup or beauty products and remedies. If you got a sensitive skin, then read the details in my post carefully as there is a set of essential beauty and skin care tips for sensitive skin that I am sharing below. These beauty and skin care tips are going to help you protect your skin much effectively. You know you got a sensitive skin and you have to be very cautious about it. Every time you plan to buy a new product from the market or plan to apply a new homemade remedy on your skin, you should do a small patch test to ensure that the product or the remedy is good for your skin type. This is one of the basic but very essential beauty and skin care tips for those with sensitive skin types. A patch test is a method to determine whether a specific product or ingredient causes any allergic reaction like inflammation etc on your skin. To do a patch test, apply a small portion of the product on your skin; wait for at least 24 hours to see whether there is any sign of allergy or reaction. If there’s one, then avoid using the product or that remedy, but if there are no sign of allergy even after 24 hours, you can apply it further. You may also do the patch test on more sensitive areas like on a small portion of your face, although it will be a bit of risk in case the product does not suit your skin. But, this way you actually can be doubly sure about the product, because an ingredient which suits the skin on your hand, may not suit the skin on your face. Not doing a small patch test on your skin before using a new beauty care product or homemade remedies can be risky and hence you should always do a path test before trying a new product or ingredient. You must have heard about the hype regarding the “hypoallergenic” products for the sensitive skin where individuals consider such products as the best for their sensitive skin. Well, the fact is, that may not be true in all cases. The simple reason is that there are no specific federal standards for governing the word “hypoallergenic” and so there is no guarantee that the products claiming to be hypoallergenic will be suitable for a sensitive skin. Hence, please avoid using them blinding and always go for the patch test as discussed above. The more knowledgeable you become about the products and its ingredients, the better you will be able to protect your skin from the harshness. And, to do that, you must never forget checking the labels of the products before buying them. Try to look for the products which are free from the paraben preservative and fragrances as these are the main causes behind the occurrence of irritation and flare ups. Also, remember, the shorter the ingredient list, the better for you. The reason is that with more ingredients, the formula becomes quite complicated, thereby increasing the chances of skin irritation or unexpected reaction. Since the vulnerability of the sensitive skin is much more than the other skin types, a proper skin care schedule must be maintained. And, that must involve properly moisturizing the skin. You have to diligently moisture your skin in the morning as well as at night. This will give protection to your skin against the water loss and also maintain a healthy barrier from the regular onslaught of environmental causes like wind, pollution, excessive cold and other sudden weather changes etc. Washing your skin properly is one of the primary and essential beauty and skin care tips for sensitive skin as the accumulation of the dirt, dust and the dead skin cells may lead to acne, pimples and several other skin issues. You must wash your skin minimum 2 times thoroughly on a daily basis and keep it fresh and clean. Choose a skin cleanser which is meant for sensitive skin. Also, see that it is not so gentle that it needs to be rubbed or scrubbed really hard to clean your face. Always blot your skin and please do not rub your face hard, instead rub your skin gently. I have already said that you got to be choosy while picking the commercial skin and beauty care products but it is even better if you use natural remedies as far as skin care routine goes. There are various natural ingredients which you can easily apply on your face. Some ingredients like cucumber, sandalwood, rosewater, honey, papaya etc. are suitable for sensitive skin and you can easily use them as a face mask and keep your skin healthy. It is not that all of the market products are bad, but the fact is the natural home remedies are definitely a safer option to try and are also very cost effective. Sensitive skin is more prone to sun damage and so you need to be careful while you are out in the sun. Always wear a sunscreen which has a SPF of 30 or high to protect your delicate skin tissues from the scorching sunrays. I will suggest you to go for the sunscreens which contain the two physical active ingredients titanium dioxide and zinc oxide as these are less likely to cause irritations or reactions in comparison to the chemical based ones like oxybenzone, octinoxate and octylcrylene. Here’s a detailed post on how to protect your skin from the sun and you may like to check this post. However, you must also not forget that little bit of sun exposure is required for your body to get the natural Vitamin D. So it is advisable that you go out for short walks in the morning and expose yourself to sunshine. I myself love to put makeup and most of us do this, but if you have a sensitive skin, then the over usage of the cosmetic products can take a severe toll on your skin, so the less makeup you apply, the better for your skin. Also, whenever you put any makeup, please remove it thoroughly before going to bed. This is important as keeping makeup on your face all night long is highly detrimental to your skin, more so if your skin is sensitive. It can lead to excessive dryness; blisters and many more skin concerns, hence don’t go to bed before you put off the makeup. Water is life and it can actually solve a lot of your health and beauty related complications. Drinking enough of water throughout the day is definitely one of the easiest and very essential beauty and skin care tips for sensitive skin. Dehydration can lead to different types of health and skin troubles. Water acts as a perfect detoxifier for your skin. It helps remove toxic substances from your system and leave your skin healthy and glowing. There can never be any alternative to drinking water but if you do not feel like drinking much of it because of its plain, boring taste, then you can definitely add on to the taste as well as the health benefits by trying out the detox water recipes which are very beneficial for your skin. Sensitive skins need extra care and so I suggest you to use facial cleaning wipes instead of the towel. The main reason is most towels are made up of harsh material which when rubbed on the skin, especially on the face, may cause damage. On the other hand, the facial cleaning wipes just needs a little bit patting on the skin instead of rubbing it, so it is safe for your skin. But if you have to use towel or handkerchief, then make sure to use the softer and cotton ones. Your skin requires proper nutrients to remain healthy and for that you have to eat healthy. Make sure your diet consists of all the healthy fruits, vegetables, and other skin friendly foods which are essential to get flawless and healthy skin. And, yes, the oily, fatty stuffs do not form a part of the healthy foods, so they are best avoided. 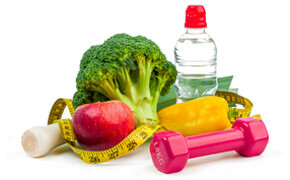 And if you want good quality healthy and glowing skin, then the processed foods must also be avoided. The kind of clothes you wear also matters if you have a sensitive skin. To be more specific, there are various dresses found in market which may not be favorable for sensitive skin. Mostly the materials they are made of are not much soothing which may result in constant skin irritations. Also, many individuals wear too tight-fitting dresses which do not allow the skin to breathe properly. And, finally, avoid repeating the clothes without washing for too long especially in the summer, firstly, because of the dirt and secondly because of the sweat accumulation, wearing clothes that is not washed properly may be bad for your sensitive skin. You may love yourself a lot but that does not mean that you have to touch yourself quite often. This is certainly a bad habit which many of us have and avoiding it is one of the important beauty and skin care tips for sensitive skin that I would like to give you. The simple reason behind why you should not touch your skin too often is that your hands are not clean all the time and may contain oils, dirt, germs etc. If you often touch your sensitive skin with a dirty hand then it may harm a lot and cause skin irritations. Hence, you should avoid over touching your skin and if you have to touch it then make sure that your hands are properly cleaned. Lack of proper rest or sleep is detrimental to skin health and studies have already shown it. It will make you extremely tired, sick and irritated which will eventually affect the overall quality of the skin. And, if it continues for a long time, it will also lead to dark circles, wrinkles, fine lines etc. Your skin will lose that vitality and luster it once had. An average adult must have a daily sleep of 7-8 hours. It is essential for your body and skin to freshen up and get energized. So, please take enough rest and keep your skin rejuvenated. And, if you have any problem to fall asleep, then you may try out my recommended list of tips and learn the easy steps to sleep like a baby, even when you are overstressed. Stress is another factor that causes lot of health and beauty complications. If you worry and remain anxious all the time, you will have the aging signs like the dark circles, wrinkles, etc. quite early in your life. You need to be at peace from within, only then the happy glow will get reflected on your skin. But sadly, today, we are so much burdened with various concerns, and work pressures that we cannot help but remain stressed most of the time which automatically takes a toll on our skin health. The problems in your life may not be fully under your control, but you can always try hard to combat stress. You may take the help of relaxation techniques, meditations, yoga etc that will help keep your mind and body calm and relaxed. Also, pent up emotions increase stress levels, so share your feelings with the trusted people around you. This generally works for me; hopefully it will work in your case as well. It is not just your skin that needs to be cleaned but also your surroundings. Living in an unhygienic and dirty environment will intensify the skin concerns especially if you have sensitive skin. I mean it is obvious that the dirtier your environment, the more germs it will contain, and exposure to germs will certainly cause skin rashes, infections etc. So, keep the indoor air and your living environment neat and clean. I know there are many attractive beauty care products available in the market which promises miracles on your skin. And, most young men and women get influenced by the ads and feels like trying every other beauty care product that is available in market. But, for a moment, just think practically that is it really possible, more so, if you have a sensitive skin. Well, certainly not. So, I would request you to continue using the products which has so far suited your skin perfectly and not nurture the greed of using every glamorous product that is available. For God’s sake, listen to your skin and let it enjoy the product that it is well adjusted to. If your skin is sensitive, then it’s best to sleep on silk or on bed sheets which is made of 100% cotton. The main reason behind this is you do sweat a lot during sleep which is nicely soaked by these materials. In contrast to these, the synthetic fabrics are non-breathable and may even trap gunk against your skin and lead to clogging of your skin pores. Also, for the best beauty sleep, get rid of all of your fabric softeners and dryer sheets as they may leave behind a waxy film which may irritate your sensitive skin even more. And, please remember to change your bed sheets especially the pillow covers weekly so that they do not get excessively dirty which may be harmful for your skin. Over to you: what’s your favorite beauty and skin care tip? Even if you have sensitive skin, you can easily maintain the health and glow of your skin by following a suitable skin care routine. You have to take good care of your skin and put in a bit of extra effort to keep your skin healthy and glowing. But, I think if in return, you are gifted with beautiful skin that can make others jealous then the efforts on your part are totally worth it. Our skin is very vulnerable, being the outer lining of our body; it is exposed to almost all the adversities and harshness including dirt, pollution, cold, heat etc. Naturally, it requires proper care to remain healthy and glowing. You need to eat right so that your skin gets its proper foods to stay naturally healthy. I mean, that is the basic thing that you must do, not just for your skin but also for your health in general. 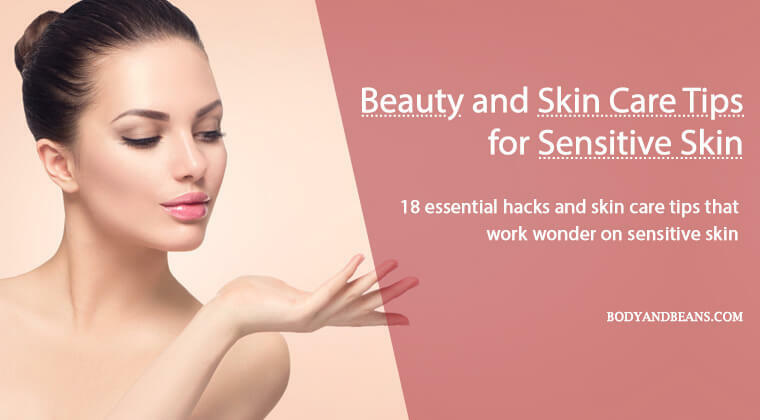 And, as far as the other essential beauty and skin care tips for sensitive skin goes, I have already shared a list of top 18 essential tips today. These beauty and skin care tips basically form an integral part of the basic skin care routine and not just individuals with sensitive skin, but also those with other skin types can follow some of these best practices. I have always said that I personally have faith in the natural care products and Do-it-yourself home remedies. Science and technology today have improved a lot no doubt about that, but I still believe that one should adapt to natural remedies to get rid of common skin and health issues. The several surgeries related to skin, too much medication, etc. many times have long term consequences, and hence it must be avoided as much as possible. Also, these procedures are often very costly, so cannot be afforded by everyone. On the other hand, the natural remedies are not just efficient but are very cost effective and hence they serve the purpose of majority of people. Beauty is God gifted but you can always groom yourself to perfection or close to perfection with little care especially for your skin. And, if you have sensitive skin, I think, you already know by now what to do to keep your skin healthy. Please do not forget to share the feedbacks with us after trying some of these beauty and skin care tips for sensitive skin. Also, if you have any other beauty and skin care tips for sensitive skin, please do feel free to share by commenting below. I sincerely hope that these beauty and skin care tips will help you a lot and you will be able to get the skin that you have always desired. Until then, stay happy, stay beautiful and please do not forget to smile as that is certainly the best beauty remedy that works well for all of us.